Business Card Printing in Cirencester : Busy Fingers 01285 656757 Printers in Cirencester. Deciding on the Right Printer for Your Business Cards in Cirencester Glos. Welcome to Printing in Cirencester. You should look for a printer in Cirencester producing high-quality business cards at reasonable prices. Not just anyone should be trusted with presenting your business' image. High-speed printing and visually stunning designs are guaranteed by BUSY FINGERS COPYING & PRINTING. Your business cards will differentiate you from your competitors. Call 01285 656757 to learn more about business cards from Busy Fingers Printing. Our Business Cards are printed on luxury 400gm Matt Art card. They can be printed in Full Colour on one side only, in Full Colour with Black and White on the reverse, or in Full Colour on both sides. The face side can be either Gloss laminated, Matt Laminated or Unlaminated. If your particular size is not detailed simply specify your requirements and price as the next size up. E.g. For a 210mm x 210mm postcard simply price as a A4 (297mm x 210mm). We make no additional charge for cutting down to a bespoke size. The cost of Die-Cutting is calculated from a setup charge and then a run on cost per 1000. We are able to offer a number of finishing options for our cards, these options can be selected under Finishing Options. We can die-cut Postcards of A5 size and upwards in to any shape you can think of! This cost is incurred only once. On subsequent runs we can use the same forme again. Please submit your design for us to price the forme required. Please note: If your card is to be folded (Eg. Double Credit Card or A4 Postcard to be folded to A5) and colour extends across the fold (on either side of the card) we strongly recommend lamination to minimize the risk of cracking on the fold. The face side can be either Gloss laminated, Matt Laminated or Unlaminated. Supplements for the same type of lamination on the reverse of any size card are also shown. If your application calls for Gloss on one side and Matt on the other please contact our Estimating Department. If the particular size you require is not detailed we can produce cards in a range of special sizes. Simply price as the next card size up. We make no additional charge for cutting special size cards. E.g. For a 210mm x 210mm card simply look at A4 card (210mm x 297mm) pricing. Please Note: Where colour extends across folds we strongly recommend lamination to minimize cracking on the fold. 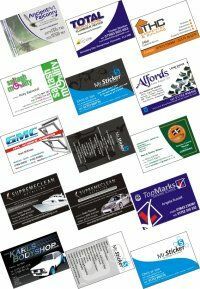 Are You Looking for Business Cards in Cirencester Glos? Business cards in Cirencester will promote your business. Have business cards to look more professional. It is important to customise your business cards to your business. A professional business card includes a striking visual design and important information about you and your business. It is important to work with an experienced and knowledgeable printer. Business cards in Cirencester should contain information regarding an individual or company. They usually contain the name of the person, company and contact information. From telephone numbers to e-mail and website addresses, all can be included in the contact information. It is important to include information about you on your business cards. Make your business cards unique so they will stand out from the crowd. The design and quality of your business cards are as important as the information that they contain. Business cards in Cirencester can be, for example, black text on white or four colours on white. Quality stock should be used for your business card paper. Compared to black and white, business cards with colour provide more of an impact. Your business card represents you when you are not present, so it is important that it symbolises your business ethics.